Note: I receive accommodation in exchange for a review. I always provide my honest opinion; I only stay at places that look awesome; and I only say a place is awesome if it truly is. Fancy sleeping above the oldest standing arches that support the ruins of an ancient emperors palace? At Diocletian’s Palace Hostel in Split, Croatia, guests are not simply close to the attractions, but in the midst of them. 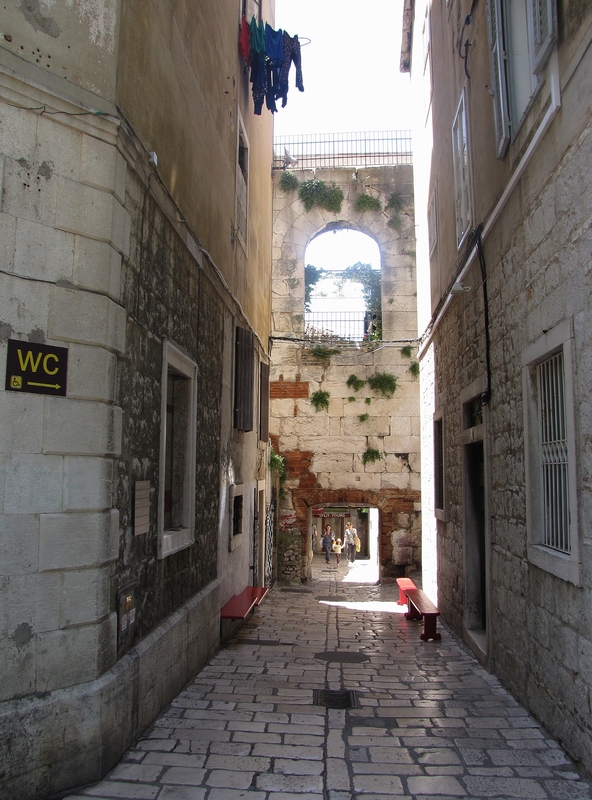 Though the location is ideal, it can be tricky to navigate the maze of cobblestone alleyways that comprise Split’s Old Town. 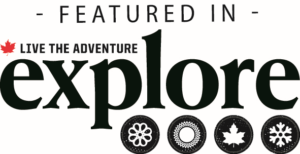 The hostel is situated on UNESCO protected property, which inhibites the owners to overtly advertise. The hostel sits ontop of a fine dinning resturant down one of the narrower streets. At the end of the fantastic almost-free walking tour (cost: 1€), participants receive a glass of free wine, which should be enough to convince guests to stay and order off the affordable backpacker’s menu. 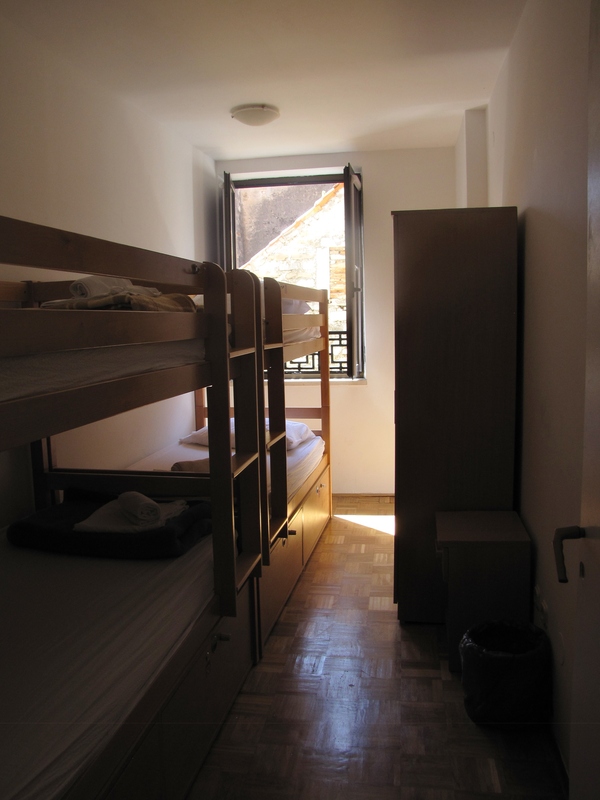 The hostel’s narrow dorm rooms mimic the skinny streets outside. They can become a bit cramped and stuffy when the room is fully occupied. Though there are large lockers for use (with a 20 kroner key deposit), the dorm room doors remain unlocked. If you’re not fussed over sharing showers seperated with curtains, holding down the nozzle head, and using co-ed toilets, Diocletian’s Palace will suit your simple needs perfectly. There are 11 dorm rooms of various size, including 1 private room. Free wifi connects with full bars in every room and the bunkbeds are quite comfortable. Upon arrival, your bed is freshly made with a small towel included. The reception is open 24/7 and the staff are friendly and informative without being overbearing. In my opinion, the hostel’s biggest downfall was its lack of a kitchen and common room. 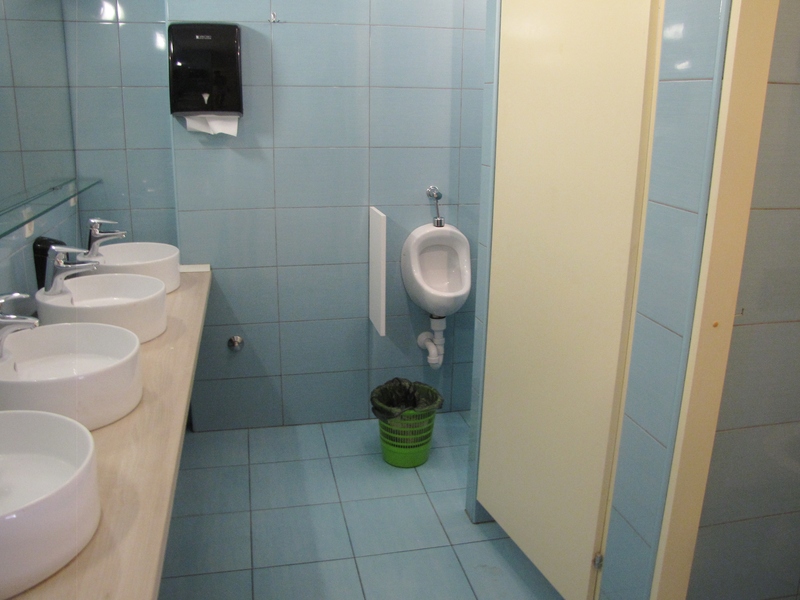 The kind manager, Josef, explained to me that it is rare for hostels in Croatia to have kitchens, and that the old common room had caused unnecessary ruckus that distrupted both the restaurant beneath and the hostel rooms above. Luckily for me, there was a solution. When I was itching for a cup of tea, the kitchen staff brought me hot water, and the many shops and fast food joints around Split were within my backpacking budget. Despite the lack of a communal hangout spot, I managed to meet some of the most amazing people I’ve encountered on my journey at this hostel. 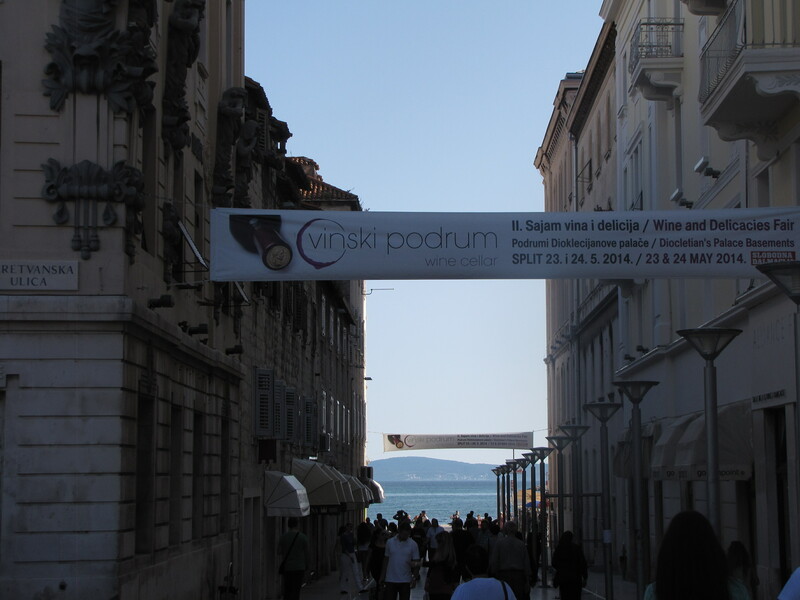 I suppose good places attract good people, and Diocletian’s Palace is no exception.